New test combines both targeted therapy and immune-oncology biomarkers in a single test with 99% actionability, providing benefits for the treatment of patients and the development of new therapies. ASCO, CHICAGO, ILLINOIS – June 1, 2018 – OmniSeq® , a CAP accredited, molecular diagnostics subsidiary of the Roswell Park Comprehensive Cancer Center, and LabCorp® (NYSE: LH), a leading global life sciences company, announced today the commercial launch of OmniSeq Advance, an assay that combines targeted therapy and immune-oncology biomarkers into a single clinical test. This novel offering is the first New York State CLEP approved assay to combine next generation sequencing (NGS)- based comprehensive genomic profiling, tumor mutational burden (TMB) and microsatellite status (MSI), PD-L1 and CD8 proteins by immunohistochemistry (IHC), and RNA-sequencing gene expression profiling (GEP) of the tumor microenvironment, all from fixed-formalin paraffin embedded (FFPE) patient samples. The test promises to provide significant benefits for the treatment of patients with solid tumor cancers and the development of new precision therapies. 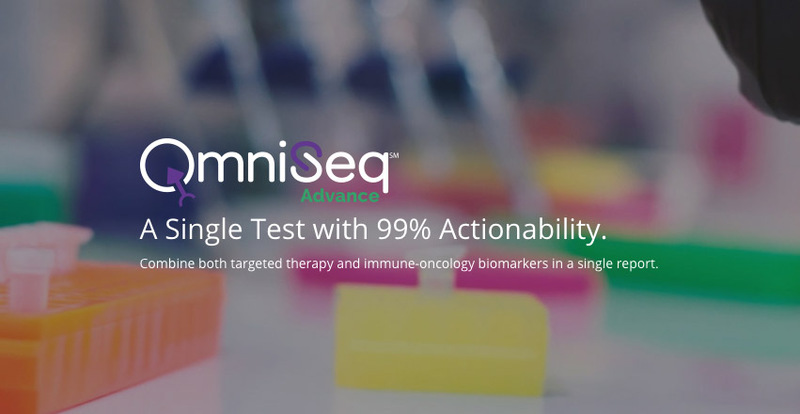 Utilizing data from patients tested with both OmniSeq Comprehensive® and OmniSeq Immune Report Card® , the company projects that the OmniSeq Advance test will report clinically actionable results for 99% of tested patients. For patients diagnosed with non-small cell lung cancer (NSCLC), physicians can test for KRAS, EGFR, ALK, PD-L1, TMB and MSI status, as well as test for rarer mutations in BRAF, RET, ROS, MET and NTRK. The company expects that over 80% of NSCLC samples will produce Level 1 or 2 evidence, as defined by the FDA’s “CDRH’s Approach to Tumor Profiling Next Generation Sequencing Tests” Fact Sheet. The launch of OmniSeq Advance follows closely after the April 2018 launch of OmniSeq MSI NGS, a tumor-only, next generation sequencing (NGS) Microsatellite Instability (MSI) assay. Microsatellite Instability High is an indication for use of specific checkpoint inhibitors for the treatment of patients with solid tumors that have progressed following prior treatment and who have no satisfactory alternative treatment options, and for patients with colorectal cancer that have progressed following treatment with certain chemotherapy drugs, for whom immunotherapy may provide hope for extended life or tumor remission. “OmniSeq Advance reflects our commitment to remain at the forefront of validating novel immune and targeted therapy biomarkers for use in both academic and community oncology practices. Our partnership with LabCorp ensures that patients throughout the United States will have access to the very best treatment decision support testing,” said Mark Gardner, Chief Executive Officer of OmniSeq. In August, 2017, OmniSeq and LabCorp announced a distribution agreement for the OmniSeq Comprehensive® and Immune Report Card® clinical assays. That exclusive agreement now includes OmniSeq Advance, as well as the OmniSeq MSI NGS test. Pursuant to the agreement, OmniSeq’s suite of advanced tests will be exclusively offered by LabCorp to U.S.-based physicians through Integrated Oncology, a member of the LabCorp Specialty Testing Group, and globally to biopharmaceutical customers through Covance Drug Development. Learn more about OmniSeq Advance℠ , OmniSeq Comprehensive® , or Immune Report Card® , or call 1-800-781-1259. OmniSeq, an innovation of Roswell Park Comprehensive Cancer Center, is a molecular diagnostic laboratory based in Buffalo, New York. OmniSeq endeavors to find the right drug or the right trial for every patient by improving access to better cancer treatment options through molecular profiling. OmniSeq offers three NGS-based assays: OmniSeq MSI NGS℠, Immune Report Card® and OmniSeq Comprehensive® . For more information, call +1-800-781-1259 or visit www.omniseq.com. Note regarding forward looking statements for OmniSeq. This press release contains forward looking statements, including but not limited to, the performance capabilities of the OmniSeq Advance test. The statements contained herein may include prospects, statements of future expectations and other forward-looking statements that are based on management’s current views and assumptions and involve known and unknown risks and uncertainties. Actual results, performance or events may differ materially from those expressed or implied in such forward-looking statements.